WJSG Internet Radio: Why Are American Idol Contestants Stuck In A Rut? Why Are American Idol Contestants Stuck In A Rut? "American Idol's" Top 12 contestants went back to where they were from on Wednesday, singing songs that best define what the word "home" means to them. 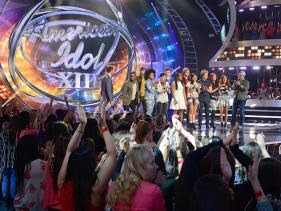 Overall, it was another shaky night from what might be the least polished group of "Idol" finalists ever. There wasn't a breakout performance in the bunch, and the judges seem frustrated with this pack of not-ready-for-prime-time players. Here's a recap of Wednesday's episode. What is it with this year's contestants? Everything about "Idol" this year is refreshed, from the format to the new studio to the renewed energy at the judge's table, but the "Idols" themselves are acting like talent show contestants who forgot their material. Jessica Meuse introduced Dido's "White Flag" by saying she performs it at every one of her shows, and then proceeded to play it like it was her 6,345th time performing it for the same group a half-empty bar at closing time; Jena Irene's version of KT Tunstall's "Suddenly I See" never got out of neutral; the normally daring Alex Preston watered himself down with a restrained take on Gavin DeGraw's "One Tree Hill" theme "I Don't Wanna Be"; and Majesty Rose tried to pack the emotion and the build of Coldplay's five-minute "Fix You" into 90 seconds and wound up sounding like she was cramming 10 pounds worth of stuff into a five-pound box. Dexter Roberts, whose main attribute is that he really sounds like a lot of country performers already on the radio, gave the night's best performance, singing a convincing version of Montgomery Gentry's "Lucky Man." But there was nothing unique about it, which so far sums up this season of "Idol." Harry Connick Jr. — or just "Junior," as host Ryan Seacrest called him — lived up to his billing as "Hatchet Harry" yet again on Wednesday. It's not that he's being a killjoy, it's just he's being honest and critiquing the contestants from a heavily technical standpoint, and not going easy on any of them. He said Jessica Meuse seemed "blasé" and that she wasn't really present; he told Emily Piriz her performance of Jennifer Lopez' "Let's Get Loud" was like a locomotive that she was a passenger on rather than a conductor; he criticized Caleb Johnson for being overly predictable week after week; he told Ben Briley he "didn't connect" with his version of David Nail's "Turning Home" and it "felt shouted" to him; and he criticized Sam Woolf for his lack of growth so far. There's no cruelty to Connick's approach -- he's not calling anyone names -- but his honesty is refreshing in the format. Wild child contestant Malaya Watson found herself in last week's bottom two, narrowly escaping being voted off after her manic version of Bruno Mars' "Runaway Baby." On Wednesday, she dialed way down by performing Tamela Mann's "Take Me to the King" while seated at a piano, standing up and driving the song home at the end of the performance. It was a marked improvement over last week, and it brought Keith Urban to his feet, while Lopez said it gave her "goosies." And it should be enough to rescue Watson from the bottom this week. MK Nobillette, who was also in the bottom last week, is at risk of going home this week after her floundering version of Train's "Drops of Jupiter." She seemed terrified to be onstage, like a little kid under the stage lights for the first time, and didn't even have the confidence to adjust the microphone which seemed positioned too high for her. She hardly mustered the energy to sing along with the song's "na na na" chorus. "MK, I still get the feeling that you don't want to be here," Connick told her. The looser format of the week's theme resulted in several adventurous song choices, from Rush to indie rockers Blind Pilot to gospel singer Tamela Mann to country singer David Nail. Usually around this time in the competition, contestants are forced into theme weeks celebrating the catalogs of Motown or Elton John, and it's refreshing to have the field opened up and to get a better sense of what artists the contestants are really into. Trust us, we don't need another Billy Joel night. Keeping with the "Home" theme, former winner Phillip Phillips will perform on Thursday's show, along with Irish rockers Kodaline. And one performer will be going home for good, driving home this week's theme in an entirely different way.